March 10, 2010: It was a Wednesday morning, when I started thinking. I thought about how I had been having a hard time making it from breakfast to lunch without a snack in between. I thought about how I had recently felt the need to nap everyday with my 8 month old. I thought about how I had cut back to 1 cup of coffee in the morning instead of my usual 3. Then I thought about the last time that all these things happened…so I took a pregnancy test. I had to take 2 tests before I truly believed, I’m pregnant…again! This was an unexpected, but nonetheless, exciting surprise. Once we got over the initial shock and worry of having a 16 month old and a newborn, we were nothing short of ecstatic about the new baby we would soon welcome. March 19, 2010: The Friday before my first Dr.s appointment, my mom took my son and I out to do some shopping. After arriving home, I walked into the house and felt a gush of fluid. It was mostly clear, with a slight pink tint to it. Not having experienced anything like this with my last pregnancy, I asked my mom (mother of 4) about it. She said I should call the Dr. just to be sure and the nurse advised me that it didn’t sound like anything and to call back if I started bleeding. Hoping that she was right, I sat down to have lunch and then headed upstairs to put my son down for a nap. As I laid him in the crib, I felt another gush of fluid and this time it was blood. I immediately called the nurse again and feared the worst, that I was losing my baby. I was told to stay off my feet for the weekend and to come in for my Tuesday appointment. 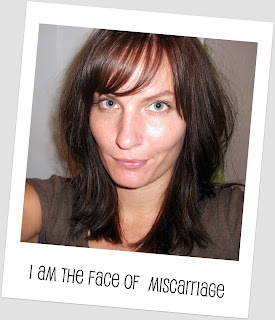 If I was miscarrying, which they didn’t seem to think I was, then there was nothing they could do about it anyways. Over the weekend my bleeding increased, regardless of the fact that I did nothing but lay on the couch and watch movies. I had resigned myself to the fact that I was losing my baby. I was heartbroken. March 22, 2010: I was able to get an appointment to go in on Monday morning to confirm the miscarriage I was sure I was having. The Dr. performed an internal ultrasound and said that indeed she could not see anything there. She decided to do an external one just to be sure, and just as she was finishing, she noticed what appeared to be a heartbeat tucked up in the corner of my uterus. She said she thought it may be a tubal pregnancy and ordered a formal ultrasound. I was advised not to eat anything in case I needed immediate surgery. A few hours after the ultrasound, we got the news. The baby was still alive with a healthy heartbeat and measured 7 weeks 1 day. However, there was a large blood clot in my uterus that was causing the bleeding. It measured 7cm in size compared to the baby at 1cm. She said that they don’t know what causes this and there was no way to know what would happen. Things could work out fine or they could not, there was nothing we could do except wait and see. March 29, 2010: We went in for a follow up ultrasound to see if anything had changed over the last week. The baby still looked good and healthy, however the clot had grown in size, rather than getting smaller. We were told that we needed to think about our options and what would be best for us. I had been bleeding nonstop for over a week and would continue to bleed as my body tried to rid itself of the clot. I could lose too much blood and need transfusions throughout the remainder of the pregnancy. My uterus could run out of room to hold the baby and the clot and I could have to deliver as early as 24 weeks. I could develop pre-eclampsia. The baby could not develop properly because of the restraint on room to grow. The list of possibilities was endless and we were forced to make a decision. Do we continue on with the pregnancy or not? This was a decision that we never thought we would be faced with and was the hardest we have ever known. April 5, 2010: We met with a perinatologist to see if she had any further information that could help us with our quest for the right answer. The hardest part about making a decision was that we didn’t feel informed. This is a condition that little is known about and we had no statistics or numbers to look at. It was just a laundry list of things that could possibly happen. She did an ultrasound and said that the placenta was attached to the uterine wall, which was good and meant that there was a possibility that things could work out fine, but there were no guarantees. After many thoughts and tears and prayers, we decided that ending the pregnancy would be best for our family. I was scheduled to go in on April 15, 2010. After making our decision, I continued to re-think and re-analyze it and decided that in the end, I would not be able to go through with it. It just was not something I could live with. We decided to wait until my 13 week appointment to see if anything had changed and then go from there. April 28, 2010: I was 12.5 weeks and headed to the Dr. that morning for my appointment. I had received a call earlier saying that my Dr. was out and I would be seeing the nurse practitioner. As I had suspected, she had no clue what was going on with my pregnancy and was only able to ask us what we had decided and then schedule me for another appointment with my Dr. the following week. She gave us our first ultrasound print to take home. It was not the best shot of our baby, but I figured we could get a better picture at the next appointment. That was the day that I came to realization that we were all in. We would see this pregnancy through to the end, no matter what happened. May 1, 2010: Three days later we had a birthday party for a friend’s 1 year old. I had experienced heavy bleeding the day before and I was feeling pretty weak, but wanted to get out of the house for a bit. We went to the party, but after a few hours I started to bleed heavily and pass a large number of clots. This was nothing too far out of the ordinary for me, but I was extremely weak and didn’t want to have an accident there, so we headed home. I knew on the way home that something just did not feel right and that this might be the end. When we got to the house, I went straight to the bathroom. I passed what felt like a large clot and when I looked to see the size, I saw our baby. I immediately broke into hysterics and my husband rushed in. Not knowing what else to do, he called 911. I was taken in to the hospital to be checked out and released a few hours later. The next day we buried our second born son, Kaden Nathaniel. He was with us for 12 weeks 6 days. We were able to hold him and look at his perfect little body and say good-bye. He was our precious little baby boy and he will be forever remembered and loved. I know that he is in heaven with our other loved ones watching over us and that someday we will see him again.